10 years after their creation, epic Viking metallers Folkearth are back with their 12th full-length album!! And while the release of a new album from this international project is something usual, this album is a special one, since it’s the first one after the death of their founding member Ruslanas (Metfolvik) Danisevskis. Metfolvik was also the founder of Folkodia, another international project, musically similar to Folkearth, but with different concept. Soon after Metfolvik passed away, the remaining members of Folkearth and Folkodia took the decision to continue both projects and to carry his music heritage for years to come. 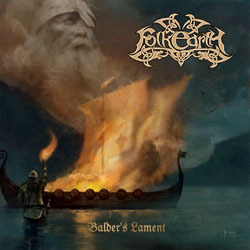 The new album of Folkearth is entitled “Balder’s Lament” and was released in 2014 via the band’s permanent label Stygian Crypt Productions. Through all these 10 years, countless musicians have passed from Folkearth; they must be over 100! It is a fact though, that in their latest releases the number of musicians has decreased significantly. So, from the oversized 30-member line-up in some of their first works, there are only 11 musicians from 8 countries in ”Balder’s Lament“, including Metfolvik, whose vocals are heard in the third song “From Volga to Bosphorus“. There is actually a strong base now and some of these musicians appear almost in all of the songs, which partly explains the much more solid sound of the band in its latest works. Gianluca Tamburini and Michaël Fiori (Saga) are the only composers and Marios Koutsoukos writes all the lyrics. Furthermore Michaël Fiori is the only male singer, while female vocals are shared between Anaïs Chevallier and Hildr Valkyrie. “Balder’s Lament” includes 10 songs, lasting for a little over 40 minutes, moving in the typical style of Folkearth, but with a slightly heavier sound. They combine epic metal riffs and folk influenced melodic lead guitars with traditional instruments (accordion, cello and violin) and a great variety of male and female vocals and choirs. The sound of their Viking metal had always influences from the classic epic metal, but this album is closer to epic melodic death metal, with less folk and acoustic elements compared to some of their previous works. Michaël’s vocals are mostly death metal growls, deep and somehow “dry”, suitable for the heavy sound of the band. Of course clean male vocals and choirs are still widely used and together with the epic ethereal female vocals, they create beautiful contradictions in their sound, making everything much more alive and interesting. Like in most of their works, I still believe that some of the clean vocals could be better… Their lyrics are all in English, dealing as always with the rich Viking mythology. This “injection of barbarity”, together with the continuous sound improvement, gives a kind of fresh air to Folkearth, something that they definitely needed, since after 12 albums in such a short period of time, repetition becomes inevitable the band’s biggest enemy. “Balder’s Lament” is a good work that will not disappoint their fans. It is released via Stygian Crypt Productions in a standard jewel-case edition CD, including a 12-page booklet with all the lyrics, illustrated by Kris Verwimp. You can visit their official profiles below for more details and some sound samples.